Baku, April 15, AZERTAC The 36th International Drug Enforcement Conference (IDEC), co-organized by Azerbaijan`s State Commission on Combating Drug Abuse and Illicit Drug Trafficking, State Customs Committee of Azerbaijan and U.S. Drug Enforcement Administration (DEA), has kicked off in Baku. Held under the motto “Leveraging global partnerships”, the two-day conference aims to bring together the high-ranking officials to fight against illegal drug trafficking and to discuss the ways of solving this global problem. Attended by around 500 representatives from over 150 countries, the international conference will create an opportunity for the experts to benefit from the modern methods of combating drug trafficking. In his opening remarks, Prime Minister of Azerbaijan Novruz Mammadov emphasized the importance of the event. 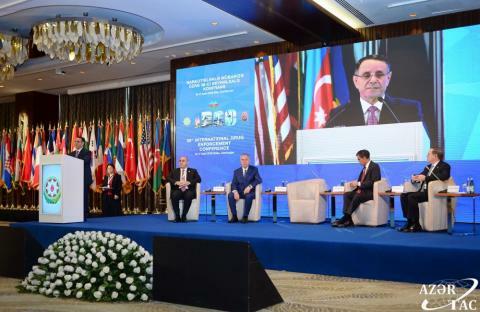 Other speakers at the event included Deputy Prime Minister, Chair of the State Committee on Combating Drug Abuse and Illicit Drug Trafficking Ali Hasanov, Chairman of the State Customs Committee Safar Mehdiyev and the US Ambassador to Azerbaijan Earle Litzenberger. IDEC was established by DEA in 1983 with the objective of creating a multilateral forum for the international police and prosecutor community to strengthen international relations and counternarcotic cooperation, share drug-related intelligence and to develop operational strategies that can be used to combat transnational, organized criminal organizations involved in the illicit drug trade. What began with less than a dozen countries in 1983 has grown to well over 130 member and observer IDEC countries, and several affiliate police observer organizations. The first IDEC was held in 1983 in Panama City, Panama.